Visiting Florida this week I decided to bring them with me (a sort of a family reunion if you will), and on day one I choose the gray-purple silk. 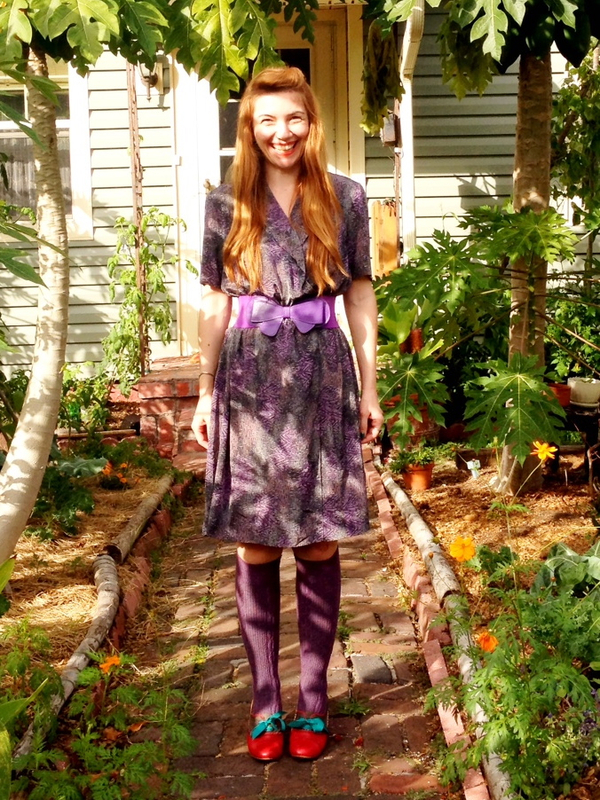 My grandma made this dress to be worn loose and flowy, but on my figure it looked too boxy that way, so I paired it with a purple belt that I bought on a trip to Istria a few years back to give it a bit of a shape. I carried the purple into the knee-high socks but broke the matchy-matchy color scheme with these fabulous new shoes from Chelsea Crew, a parting gift from my boyfriend when he left for England in June. He was hoping they would cheer me up, and while on that particular day I was too sad to rejoice, they do make me smile every time I put them on, and I absolutely love wearing them. Comfortable and pretty, they are exactly what all shoes should be if there is such a thing as “should”. When we hit the thrift stores for our standard treasure-hunt later in the day I couldn’t help but think about all the other grandmas whose dresses I was probably shifting through, hoping they would be happy to know I was the one who will “inherit” those that fit me. For to me a beautiful piece of clothing is a form of art, to be cherished and cared for the same way you would be with a painting or a sculpture, and I love saving these orphans of emptied closets, for as long as I can. Here’s hoping that whoever inherits mine will love them as much as I do. ← Could You Pass the Grateful?